Palm Island Grenadines is near Tobago and one of the Caribbean's best kept secrets. If you're longing for a small island not yet overrun by tourists, where you can feel like Robinson Crusoe and still have all the comforts, this is the place. You get to Palm Island via a 10 minute speedboat ride from Union Island, which receives flights from many Caribbean destinations including Barbados. There are only 37 rooms at the Palm Island Resort, overlooking one of the most stunning white sand beaches in the world with vivid blue water to match. The view from the main beach includes a panorama of yachts and other sea going vessels and it takes only an hour for a very pleasant stroll right around the island with its beautiful white sandy beaches. The beauty of this is that you have your accommodation near you wherever you go. There are two bars to choose from at the resort - the main bar and the Sunset Bar. There are two restaurants as well, providing welcome variety on a small island. This is an idyllic island that's quiet by day and has a little music at night, so it's perfect for romantic couples, but there's not so much to do for children. The music consists of an occasional Caribbean steel band or other live music on some nights, so it's as close to a real Caribbean island holiday that you can get without the touristy distractions of bigger islands. 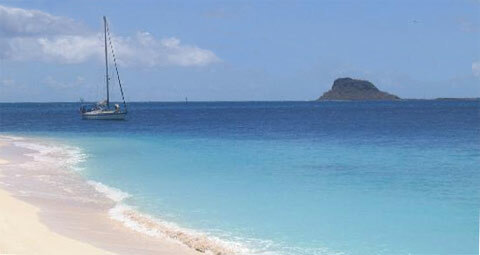 Try a day trip on a genuine wooden sailing boat such as the Scaramouche or the Pink Lady to the fabulous Tobago Cays. Swimming with the turtles is a memorable experience as you sail around the small Grenadine islands near Palm Island. Snorkelling in the crystal clear water or just taking a dip in the beautiful surroundings is just wonderful. Your accommodation near the beach on Palm Island is really about as close to the beach as you can get. When you hear of "accommodation near the beach," it's not always really accommodation near the beach at all. But here on Palm Island your accommodation near the beautiful beach IS as close as it gets. Just walk out the door of your laid back lodgings and there it is, a perfect Caribbean beach right in front of you. On the other side of Palm Island you'll find a few secluded hammocks to take in the view of even more deserted stretches of beautiful white sandy beach. Many British tourists come to Palm Island, usually outnumbering the Americans who make their way down through the Caribbean. And it's mainly couples here aged from about 30, all having a perfect holiday on a perfect Caribbean island. Palm Island best beach holiday travel destinations are written by dedicated photo journalists, published and edited by the World's Best Holidays Travel writer. Contact Best Beach Holidays to submit your beach holiday articles.